For those of you looking for an alternative to KFC or Kentucky Fried Chicken, do give Popeyes a try especially with the set lunch promotion. I just tried it last week at the Sunway Pyramid branch & it was great as it came piping hot & fresh tasting chicken together with the tasty cajun fries & warm biscuit that is crispy on the outside & soft on the inside which is similar to my favourite scones! Admittedly Popeyes fried chicken may not be as tasty as KFC, but it somehow tastes similar to the home-cooked type. Additionally, it boasts being marinated for 12 hours, hand battered Cajun chicken with special Louisiana seasonings. On top of that, the receipt also comes with a survey which is accessible at www.tellpopeyesmalaysia.com similar to those found at TGIF. Once completed within 2 days after the purchase, a code will be given which can then be exchanged with a FREE 1 piece chicken wing & biscuit! 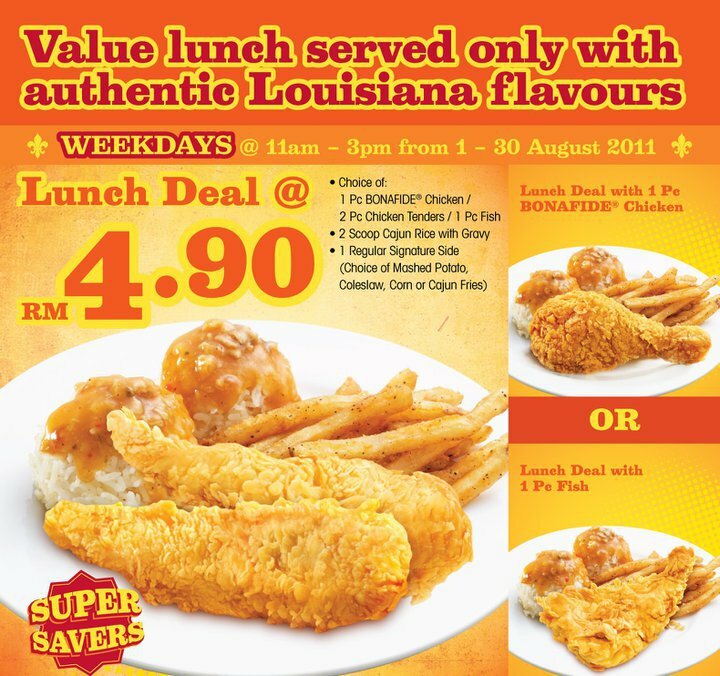 The Popeyes Lunch Deal is at an unbeatable value of ONLY RM4.90! It is valid with minimum delivery order of RM 20. This entry was posted on Tuesday, August 9th, 2011 at 5:48 pm	and is filed under Fast Food, Food Promo, Heavenly Klang Valley Food, set lunch. You can follow any responses to this entry through the RSS 2.0 feed. You can leave a response, or trackback from your own site.